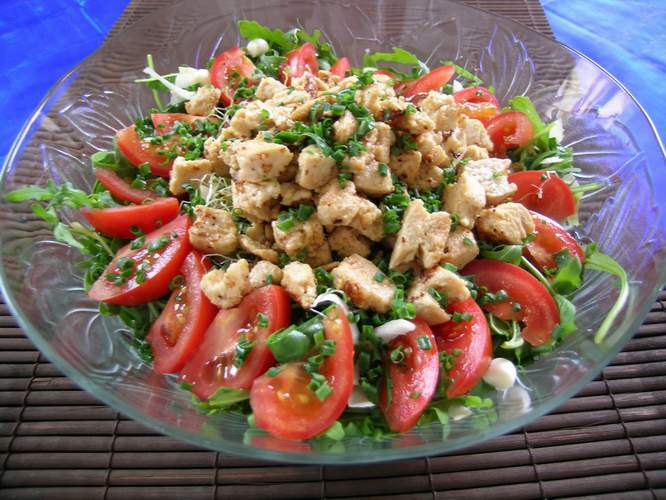 White chicken meat is commonly used to make both everyday and festive salads. Chicken goes well with vegetables and some fruit. Be creative and amaze your household and guests a variety of salads. Boil water in a saucepan. Salt and put into it two fresh chicken breast. Cook 3 to 5 minutes. Turn off the heat and soak the breast in the broth with the lid closed for another 20 minutes. White meat in this preparation will turn out juicy and elastic, without large fibers, which some people don't like chicken. Mushrooms (250 g) cut into large chunks and fry along with onion (1 piece) in a frying pan until the excess moisture evaporated. Mushrooms can be fried until crisp or just a little stew with onion, as you like. Slice the chicken pieces and place in a salad bowl. One salad cucumbers clear from the skin, grate and lightly add salt. After five minutes, squeeze out excess water and put the cucumber in a bowl with chicken. Add the sauteed mushrooms. Grate hard cheese (200 g) and two boiled eggs. Salt the salad to taste and season with mayonnaise or sour cream. Vegetable salad with chicken fillet. One large raw chicken fillet cut into cubes and quickly fry in a hot pan, to a light crust.Tomatoes (2 pieces) cut into slices. Cucumber – diced. Lettuce tear by hand. Dill and green onions chop. Mix the salad greens and cucumber in a large bowl, add salt and season with vegetable oil. Then put chicken pieces and the edge of the bowl, decorate with slices of tomatoes. Boiled chicken fillet cut into long stripes. Small fresh pineapple, peel off the skin and cut into slices. Hard cheese (200 g) RUB on a coarse grater. Combine all ingredients in a bowl and add light mayonnaise. When boiling chicken breast with bone the broth, it is very convenient to cook at once and the first dish, and salad. Separate the white meat and use it for the salad.